Republican presidential candidate Donald Trump loves to remind people he's at the top of the GOP presidential field almost as much as he enjoys perpetuating the myth President Obama is a Muslim from Kenya. Indeed, the incendiary real estate mogul leads in the 2016 national Republican primary polls, but that doesn't mean a majority of Americans see the GOP frontrunner as presidential material. A new Bloomberg Politics poll shows nearly 70 percent of Americans do not realistically envision Donald Trump as president of the United States. Concurrently, almost half of the 1,001 American adults who participated in the poll say they have a "realistic vision" of Hillary Clinton becoming president. 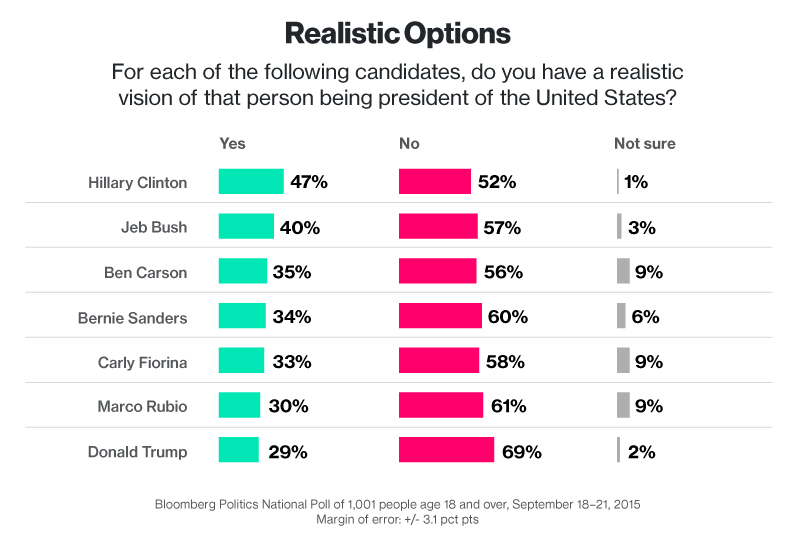 In other words, this poll suggests Americans see Clinton as the most realistic candidate for president, and Trump as the least. What this all goes to show is it's far too early to draw any comprehensive conclusions about whom we might see in the White House after next year's election. It's also unlikely this will shut up Trump any time soon, but one can always hope.